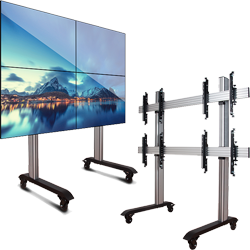 B-Tech’s dynamic System X range, is a contemporary mobile video wall mounting solution which is available to order in a variety of different configurations. 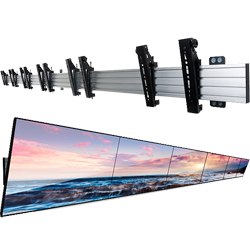 The system’s universal design supports all models of video wall screen and is lightweight yet incredibly strong with a high-end aesthetic quality. Important time saving features such as tool-less 8 point micro-adjustment and a universal screen position spacer to speed up the installation process are included as standard. 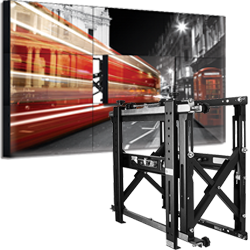 Modular video wall mounting systems for video walls of any size. servicing and maintenance and 8 point micro-adjustment, making accurate screen alignment quick and easy. The Btech Menu Board Mounting solution is a modular mounting system designed for menu board installations of any length. This Solution can be used in thousands of different configurations and must be ordered according to your requirements.